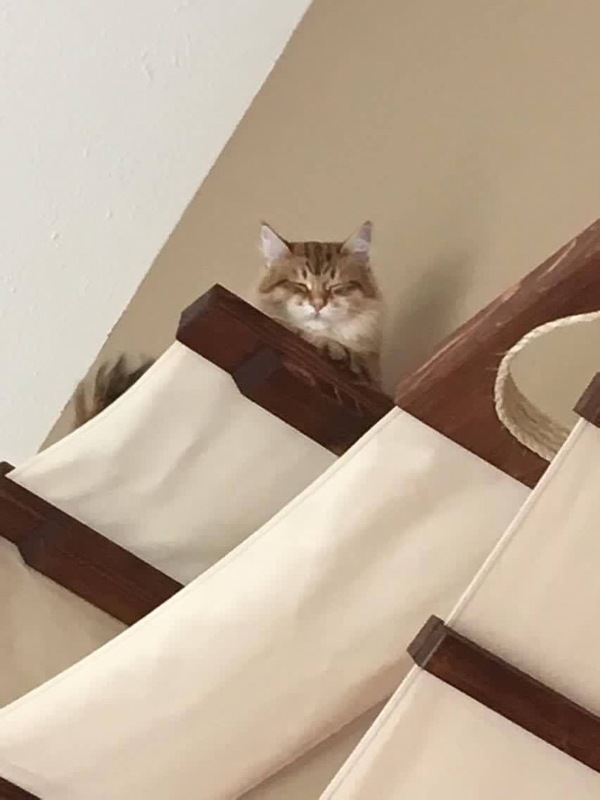 This masterpiece was dreamed up by Jill for her beautiful Siberian cat, Nadia, formally named ForestWind Wendelyn. When Jill first contacted us, she said she had been waiting for inspiration to strike to put something on that big 15’ wall. We’re so happy that we could help to create her vision. She sent along some photos of Nadia supervising the construction of her new play structure, as well as a video of Nadia testing out the new playground prior to completion. She was a pro from the start and took to this new stomping ground without fear! Seeing the work in progress was nothing compared to the finished product. We were absolutely blown away after seeing Nadia’s wall! It’s a joy to know that we were able to help get Nadia playing and lounging in the living room with her family again, safely above some new puppies Jill got. Special thanks to Jill for sharing all these wonderful photos, and to her husband who did an amazing job with the installation! So awesome! Wish I had high ceilings! Thanks Linda! We were saying the same thing when we first saw these. Can i order and get this product delivered in India on a great discounted price. Hey there, We do ship to India. To see what the shipping cost is, you can place the item in your cart and then enter your address. The website generates a shipping quote before you are asked to pay for the items. I know the first item is pretty expensive, but items added to orders do not raise the price very much. Thanks! This is absolutely wonderful. 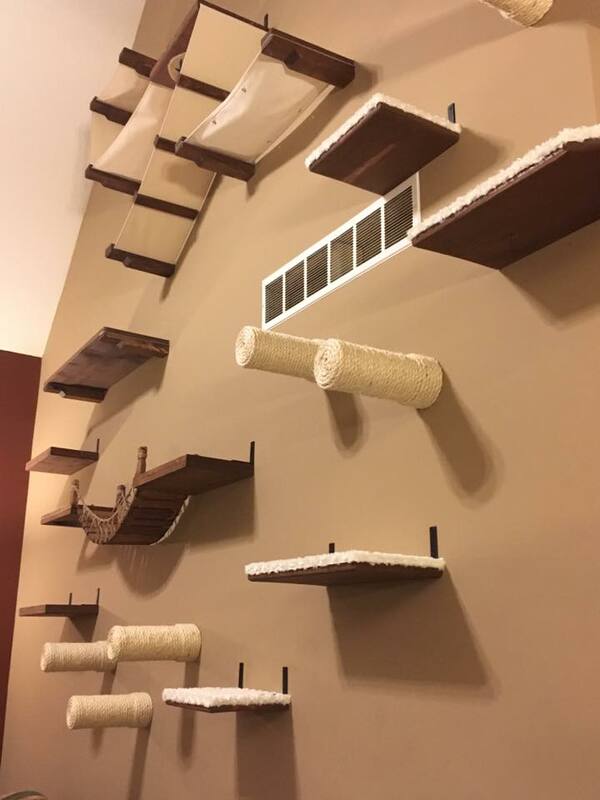 My cats would be enthralled. I wish I was either much more creative or your wonderful adventure playgrounds were available in Australia. I do think, though that Nadia, who is extremely beautiful, needs a friend to share her playground with. Thanks Liz, I agree with you as far as her needing a buddy up there. We do ship to Australia, but shipping is pretty pricey. We are working towards keeping a stock of items in each continent, but we’re still probably a year away before we cover each one. Hopefully soon though. Thanks! Your emails always make my month!! Thank you for your artwork! Incredible! And exactly what we want for our vaulted ceilings. Unfortunately, we’ve had some cat falls from much lower, ending up in a dislocated knee in one case. 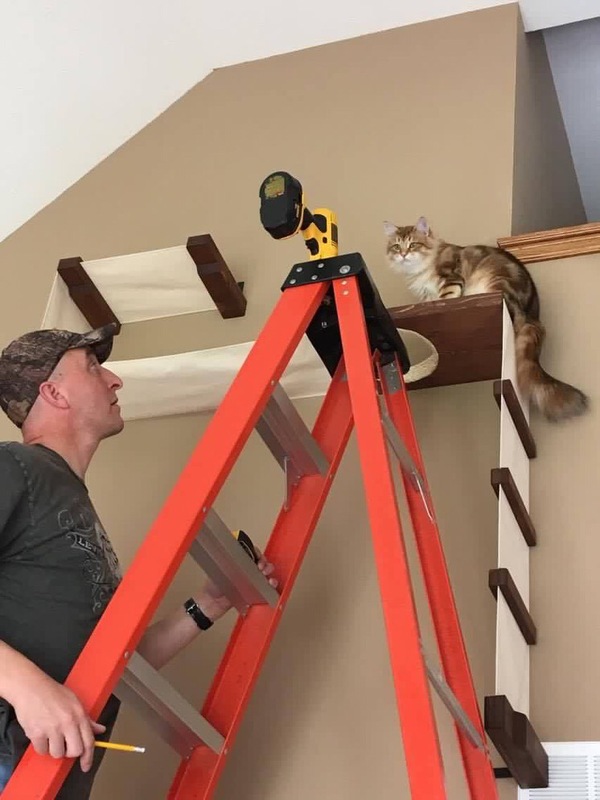 How do you ensure cat safety? Thanks! Hi Cary. I’m sorry to hear one of your cats was injured! Our Roped Cat Bridge and Cat Mod Bridge have twine “handrails” that act as a barrier, so this could be helpful. 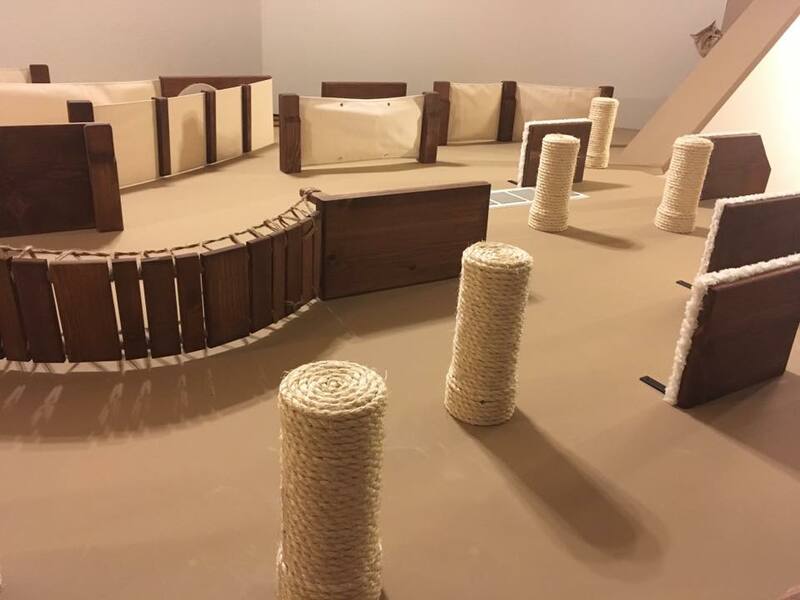 We also have sisal and fabric-covered items like the Floating Sisal Posts and 12″ Plush-Covered Cat Shelves shown in this post. 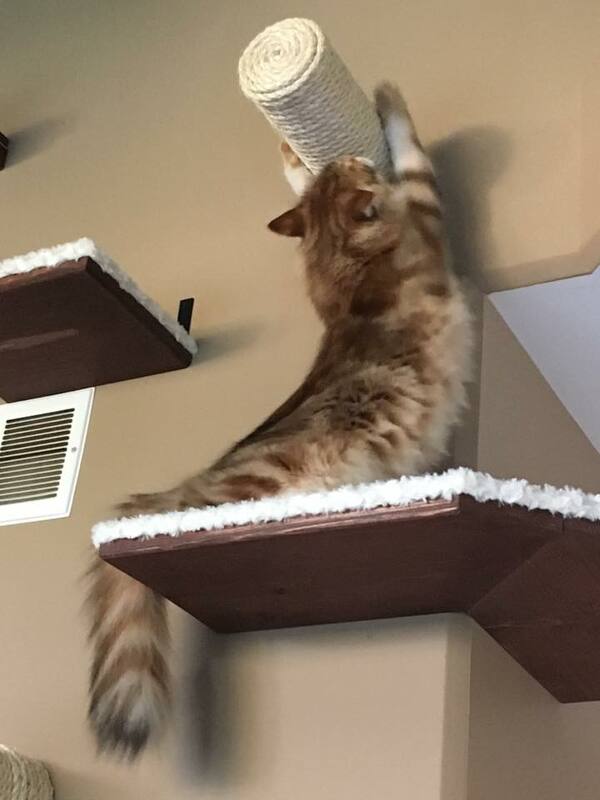 These items offer extra grip when cats navigate the furniture.